OSHA is now on Twitter! 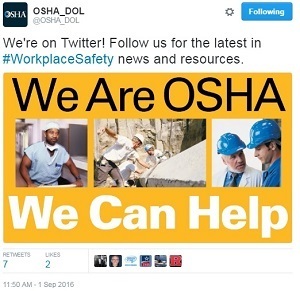 OSHA now has its own Twitter account. Follow @OSHA_DOL for the agency's latest activities and to learn about coming events, resources and regulations. Every page on OSHA's website can now be translated into Spanish with one click of your mouse or tap of your finger. Just go to the Spanish link at the top right corner of every webpage to have the text instantly translated. This will even allow you to read all the content in current and past issues of QuickTakes in Spanish online. 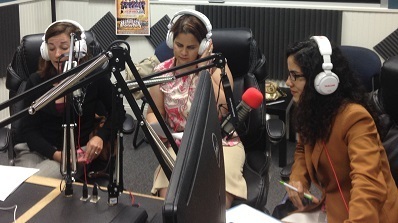 An August 24 broadcast at radio La Que Buena Atlanta 101.9 FM promoting Labor Rights Week. From left: Rachel Mast of DOL's Wage and Hour Division, Marilyn M. Velez of OSHA and Fabiola Jimenez-Moran of the Consulate General of Mexico in Atlanta. Labor Rights Week began on Monday and runs through Sunday, Sept. 4, with events at consulates, embassies, and community centers across the country under the theme: "Your work has dignity. Know your rights." The event, which the Department of Labor has participated in for eight years, educates workers on basic workplace rights, such as health and safety, fair pay, and protection against discrimination. In Washington D.C., Secretary of Labor Thomas E. Perez renewed partnership agreements with embassy officials representing Ecuador, Guatemala, Honduras, Peru and the Philippines to provide workers with information about U.S. labor laws, including workers under H-2A and H-2B visas. In addition, OSHA and Wage and Hour staff participated in live Spanish language radio programs in Georgia and Nevada, and conducted workshops across the country. To find an event in your area, visit OSHA's Labor Rights Week page. OSHA's severe injury reporting requirement, now in its second year, continues to show a disturbing trend of seven reported amputations a day at U.S. workplaces. The positive news is that the reports are leading to inspections, citations, and agreements with employers to make changes that will protect many more workers from injury. An analysis of the first full year of the requirement, under which employers must report any worker's hospitalization or amputation, showed that 2,644 amputations were reported in 2015. 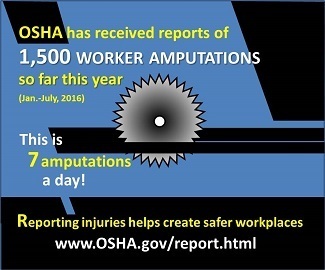 So far this year, as of July 31, OSHA has received 1,500 amputation reports. The rate works out to be about 7 amputations per day for both years. Some resulting inspections found pervasive violations at worksites, but as part of a settlement process, employers have agreed to make extensive worksite improvements. Schwan's Global Supply Chain created a comprehensive safety and health program for all its facilities nationwide, and hired a professional to run it, after two workers suffered amputations in less than three months. Ohio Gasket & Shim Company agreed to use OSHA's On-site Consultation Program and implement a comprehensive safety and health program, along with other specific improvements, after a worker lost three fingers in an unguarded machine press. "In case after case, the prompt reporting of worker injuries has created opportunities to work with employers that we wouldn’t have had otherwise," said OSHA Assistant Secretary Dr. David Michaels. "The result is safer workplaces for thousands of workers." An employee of Tyson Foods Inc. in Center, Texas, suffered an amputation when his finger became stuck in an unguarded conveyor belt. The worker was attempting to remove chicken parts jammed in the belt. OSHA inspectors cited the chicken processing facility with 17 serious and repeated workplace safety violations including: exposing workers to high levels of carbon dioxide and paracetic acid without providing protective equipment; failing to ensure safety guards were installed on moving machine parts; and failing to train workers on hazards associated with peracetic acid. "As one of the nation's largest food suppliers, Tyson Foods should set an example for workplace safety rather than drawing multiple citations from OSHA for ongoing safety failures," said OSHA Assistant Secretary Dr. David Michaels. The company was issued $263,498 in proposed fines. Read the news release for more information. OSHA opened an inspection of a residential construction site in Glen Carbon, Ill., after inspectors observed five roofers working at a height of 13 feet without fall protection. The agency cited Barringer Brothers Roofing with 10 willful, repeated and serious safety violations and proposed $89,100 in fines for exposing workers to falls. OSHA has cited the owner, Robert Barringer III, 19 times under various company names in the past decade; he is currently in default on $267,900 in federal penalties. The agency placed Barringer in its Severe Violator Enforcement Program. For more information, read the news release. The U.S. Postal Service has again been cited and fined after an OSHA inspection of the Silver Spring MPO Carr Annex Hotel in Maryland found several safety violations. The agency responded to a complaint of blocked exits, and tripping and fall hazards. Inspectors also found electrical equipment was used improperly, exit signs were not posted, and violations of recordkeeping requirements. The Postal Service faces $111,540 in proposed fines. Read the news brief for more information. A homebuilder and a subcontracting company were cited after OSHA inspectors observed workers at an Ocala, Fla., job site installing roofing sheathing without fall protection. The inspection was part of OSHA's Regional Emphasis Program on Falls in Construction. The agency cited D.R. Horton Inc. and subcontractor, Garcia Carpentry LLC, for failing to provide workers with a fall protection system while working at heights up to 25 feet. Other violations included failing to provide workers operating powered nail guns with eye protection and not requiring the use of hard hats. Combined penalties total $107,785. Falls are the leading cause of death in the construction industry. Read the news brief for more information. California OSHA has cited Kittyhawk Inc. $73,105 for serious safety violations following an incident where a worker was asphyxiated in a confined space. Cal/OSHA investigators found the Garden Grove-based metal processing company failed to comply with confined space regulations. On March 13, a Kittyhawk supervisor sent an untrained production assistant into a pressure vessel furnace to perform maintenance. The assistant was not provided with an oxygen sensor when he descended into the furnace, which was filled with argon gas. When the worker was overcome by the gas and collapsed, a second worker who went into the furnace after him became dizzy and lost consciousness. For more information, read Cal/OSHA's news release. OSHA is asking interested parties to submit comments on three guidance documents related to chemical safety. Each of these guidelines for compliance with OSHA's process safety management standard addresses a different area: pyrotechnics manufacturing, small businesses and storage facilities. The documents were developed by a working group that includes OSHA and five other federal departments and agencies established to oversee chemical facility safety and security under President Obama's Executive Order 13650 "Improving Chemical Facility Safety and Security." The EO was issued following several chemical facility catastrophes in the United States. The working group summarized its progress in a May 2014 report to the president. Comments about docket OSHA-2016-0021 at www.regulations.gov must be submitted by Sept. 23. Recovery crews assisting in the cleanup following extensive flooding in Louisiana should be aware of the hazards they may encounter and take necessary steps to stay safe. Thousands of residents, including seven OSHA employees, were displaced by the flooding. Only workers provided with the proper training, equipment and experience should conduct cleanup activities. "Recovery work should not put you in the hospital," said Benjamin Ross, OSHA's acting regional administrator in Dallas. "OSHA wants to make certain that all working men and women, including volunteers, return home at the end of the workday." Individuals involved in recovery efforts can find safety information on OSHA's resources webpage, or may call OSHA's toll-free hotline 800-321-OSHA (6742). For more information, see the news release. Nearly 240 companies around the state partnered with the Michigan Occupational Safety and Health Administration last week to "Take a Stand" for workplace safety and health—almost twice the number of participants in 2015. "The record-high participation in this year's 'Take a Stand' Day demonstrates a strong commitment to protecting Michigan's working men and women," said acting MIOSHA Director Bart Pickelman. For the 12 consecutive years, MIOSHA has sent its safety and health professionals to Michigan worksites to provide one-on-one consultations and address hazards requested by employers. For more information, see the news release. OSHA is trying out an expedited process for managing whistleblower complaints. The new pilot program allows whistleblowers under certain circumstances to receive a determination on their complaint more quickly – and without losing their rights to a hearing – by asking OSHA to issue findings for an administrative law judge to consider. The pilot, which began Aug. 1, is being tested in California, Nevada, Arizona, Hawaii, and the islands of American Samoa, CNMI and Guam. OSHA enforces the whistleblower provisions of 22 statutes that protect workers who report violations of various laws. Detailed information on workers' whistleblower rights is at www.whistleblowers.gov. For more information on the pilot program, see the news release. The Federal Advisory Council on Occupational Safety and Health will hold its next meeting Sept. 8 from 1 p.m to 4 p.m. in Room N-3437, U.S. Department of Labor, 200 Constitution Ave., N.W., Washington, DC 20210. The meeting is open to the public. FACOSH advises the Secretary of Labor on all matters relating to the occupational safety and health of federal employees. The Sept. 8 agenda includes: updates on the U.S. Department of Labor's 2015 data collection of federal agency injuries and illnesses; OSHA's efforts to protect workers from the Zika virus; the U.S. Department of Defense's implementation of a Safety and Health Management System; and the status of OSHA's Safety and Health Program Management Guidelines. For more information, see the news release. The National Advisory Committee on Occupational Safety and Health will hold a meeting of the Emergency Response and Preparedness Subcommittee in Washington, D.C., Sept. 7-9. The subcommittee will finalize its discussion of potential elements of an emergency response and preparedness proposed rule, and prepare a recommendation to the full advisory committee. The subcommittee will meet 8:30 a.m. – 4 p.m. in Room N-4437 at the U.S. Department of Labor, 200 Constitution Ave, NW, Washington, DC 20210. The meetings are open to the public. For more information, see the news release. A private business in North Dakota and a community aid organization in Florida were both recently accepted into OSHA's Safety and Health Achievement Recognition Program. SHARP recognizes small business employers who have used OSHA's On-site Consultation Program services and operate an exemplary safety and health program. The Steffes Corporation's Grand Forks, N.D., facility became the company's third facility to earn SHARP certification. Steffes' participation in SHARP, and its establishment of an active safety committee, has resulted in reduced injury and illness rates, lowered insurance costs, and increased production for the company. Chapman Partnership, a non-profit organization providing services to the homeless – such as community food, housing and emergency relief – is the first organization of its kind in Miami, Fla., to become SHARP certified. Working with OSHA consultants, Chapman has continuously improved its safety and health programs, self-inspection processes, and training programs. Capital Safety/3M is voluntarily recalling its original Lad-Saf™ sleeve used to prevent falls from fixed ladders. 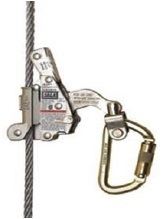 The sleeve connects the user to a cable and locks onto it in the event of a fall. A review in the field by the manufacturer found that potential misuse of the device, such as interference with the braking mechanism or attaching the sleeve upside down, could result in serious injury or death. The company is urging that any use of the original Lad-Saf™ sleeve be stopped immediately and that 3M Customer Services be contacted for information on how to return the product and receive a replacement. For more information, see the recall notice. 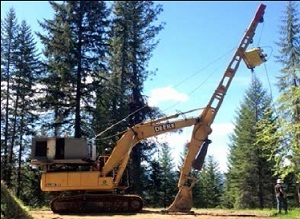 An excaliner with excavator pressed to the ground, used to maintain tension on the skyline. Photo courtesy of CDC/NIOSH/Oergon OSHA. A new addition to OSHA's Fatal Facts series demonstrates how critical it is to conduct inspections on equipment prior to every use, and implement site-specific work procedures during skyline-skidding operations. This Fatal Facts publication describes an employer's failure to identify and correct hazardous working conditions that resulted in a worker's death at a logging operation worksite. In this instance a worker, on his first day with this employer, used a remote control to set and lock the carriage on a machine used to hoist logs. The worker went beneath the carriage to attach the logs when the motor stalled and the skyline lost tension, causing the 1,200-pound carriage to drop and crush him.